Have you ever seen a news story about someone with a phenomenal memory? Maybe someone who could miraculously remember sequences of numbers or objects? Have you ever been invited to attend a workshop that promises to help you improve your memory? Perhaps it promised to help you remember people’s names, among other day-to-day things? If you’ve attended this type of workshop, or if you’ve seen an interview with someone who has a remarkable knack for recalling seemingly random items, you may already know the method. In short, the trick is to associate items with familiar visual cues. I attended a free mini-workshop like this a few years ago. The facilitator had us envision a castle; he prompted us to visualize each item we needed to remember in a different room of that castle. It worked impressively well – many of us who attended still remembered the full sequence months later. Part of the foundation of learning psychology, schema theory suggests that memory consists of interrelated networks of knowledge, or mental models. Our experiences constantly build and revise these mental models, which we use to solve problems and understand the world around us. The more firmly we can integrate newly learned knowledge with our existing mental models, the more likely we are to be able to recall that knowledge later. That’s why recall is so important. Regardless of which instructional design model is your favorite – Gagne’s nine events of instruction, Merrill’s first principles, or something else – stimulating recall is likely an important component of it. Many interpret this recall step as a review from a previous lesson, reading, or training session. While it certainly can be a review of recent learning, it doesn’t have to be. The key is to help learners conjure up an existing mental model, so that it’s easily accessible for integrating the new knowledge they’re about to learn. So, it can also be effective to prompt learners to relate information to other personal experiences; the idea is to prime the schema for new content. Schema theory also supports the effectiveness of stories and scenarios in learning. A compelling story can help create, or dramatically build, a schema itself. When learners practice skills with problem-based scenarios, those scenarios are likely to include realistic triggers from a story, a learner’s mental models, and the work environment. Has schema theory helped inform the way you design eLearning? If so, please share your two cents. If you’d like to learn a little more about it, check out the resources below. Emmott, C., & Alexander, M. (2009). Schema theory. In S. Shapiro (Ed. ), Review of Educational Research (Vol. 75, pp. 531-566). Driscoll, M. P. (2005). Psychology of learning for instruction. Boston: Pearson Allyn and Bacon. Norman, D. A. (1983). Some observations on mental models. In D. Gentner & A. L. Stevens (Eds. ), Mental models. Hillsdale, NJ: Erlbaum. Trivantis gave a sneak preview of their upcoming Lectora Version 11 release at this week's user conference in Chicago. Many of us have been nervous that Version 11 brings a complete interface redesign (yes, I still fondly remember the old "traffic lights" from before the previous redesign). But the switch to a ribbon format seems sleek and even user-friendly at this point. Version 11 brings more Social Media integration which will excite many. But truthfully, I'm not sure how that will be received by corporate America. Twitter and RSS feeds and the like are cool, but probably still off limits in eLearning courses for the scores of companies that still lock out Dropbox. So that seems a little more sparkle than substance at the moment. But I can see the coolness factor. So what really excites me about the redesign is more on the practical side. Trivantis has finally simplified a few things that have long frustrated us Lectora developers. For example, here are 3 things that, though smaller changes, will make our lives easier. Version 11 will allow developers to change the properties of multiple selected objects. No more having to painstakingly adjust properties one-by-one of like objects on a page when a color needs to be changed or a margin increased, etc. The new Lectora will give us a visual cue when conditions exist for an Action. Currently, you have to open the Conditions tab to see if anything is there. The visual cue is going to make troubleshooting a lot simpler. And it will help avoid gotchas that can happen when copy/pasting existing Actions or inserting them as Library Objects. And Version 11 will simplify inserting tables. This one has been long requested as the only way to insert a table was by a sub-menu that only appeared when right-clicking within an existing text box while standing on one leg, or so it seemed. Anyway, an easy way to insert a table is great news. So while these are probably smaller additions than Trivantis will be promoting with the Lectora redesign, they're very welcome changes to me. I'm sure there will be other pleasant news as we learn more about Lectora Version 11 (such as hopefully further movement into HTML5). But from the preview, these were 3 that stood out. As I hear more, I'll try to post my favorites. What are you hoping Lectora will make easier? What are you reading for eLearning insight? It seems that many of us in the training industry are avid readers, particularly when it comes to reading for professional development. And while I’m sure I’m not the only one with an ever-growing reading wish list, I’m also continuously on the lookout for recommendations to add to that wish list. Books about training, consulting, and trendy business topics. Take a moment to browse the online bookstores of the International Society for Performance Improvement (ISPI) or the American Society for Training and Development (ASTD), and you’ll likely find a year’s worth of reading ideas. Bookstores from other relevant professional associations likely have some good reads, too, such as the Society for Human Resource Management or the American Evaluation Association. Another good source of ideas is to find out which books university programs in the field recommend. Although the idea of buying a bunch of textbooks might not be appealing to some, you may be pleasantly surprised to find that not all of the required reading materials take the form of a traditional textbook. For instance, when I was in the Instructional and Performance Technology master’s program at Boise State University, the books required for my classes included The Performance Consultant’s Fieldbook by Judith Hale (included a CD with several consulting templates), Systems Thinking Basics by Virginia Anderson and Lauren Johnson (an easy-to-read workbook), and Analyzing Performance Problems by Robert Mager and Peter Pipe. These, and several of the books I read for my coursework, were very informative yet did not have that traditional textbook feel. What are your clients reading? Although these reads might not relate to training specifically, they can offer a unique source of inspiration for your work or simply help you better relate to your clients. Even if you tend to take a skeptical view of the fads promoted by the latest bestsellers in business, being familiar with them may still spark ideas or at least give you a sense of what informed some of your clients’ ideas. What are the leaders of your organization reading? If you have your sights set on upward mobility, reading some of the books your leaders read may help you better relate to them, too…even give you some casual conversation material. You know that cliché about dressing for success? Perhaps there’s also something to reading for the job you want. Journals and magazines about workplace learning, performance improvement, and related fields. Journals are worthwhile reads because they’re timely, and they tend to be firsthand sources of the evidence for our evidence-based practices. Many journals are peer-reviewed, meaning that a submitted article is reviewed by others in the field who evaluate the submission for its quality, rigor, and relevance to the field. Examples of journals that are especially relevant for those of us in training include Performance Improvement Quarterly, Journal of Workplace Learning, and Human Resource Development Quarterly. For those who prefer more casual reads, there are plenty of other publications that publish research in a more conversational tone or that simply summarize findings and ideas from other sources. ASTD’s Training + Development magazine and ISPI’s Performance Improvement Journal are both examples worth taking a peek at. You might also consider magazines from closely related fields. Personally, I’m a bit of a neuroscience nerd, so I enjoy – and often gain inspiration from – Scientific American Mind. Those who are heavily involved in eLearning development might enjoy magazines for programmers or graphic designers. And those of us who write training content may pick up some helpful nuggets from literary and other writing-related magazines. What are your favorite bloggers reading? If you’re reading this post, there’s a good chance you followed a link from Twitter or an RSS reader. Which means you’re probably following other eLearning blogs, too. Follow your favorite bloggers on Twitter (I know, many of you probably do this already), since folks often tweet about what they’re reading. Note references to books or articles within the blog posts themselves. Some online articles include a References or Related Readings section at the end – I’ve noticed this consistently with eLearning Guild content and ISPI’s PerformanceXpress. Looking for other good eLearning blogs to follow? Check out eLearningLearning.com, a site that aggregates top eLearning blogs from around the world (and which we're proud to be included in!). Although I’ve recommended some of my favorite reads here, I realize there are probably many good ones I’ve either neglected to mention or that are simply not on my radar at all. So what do you read? And where do you find inspiration for your reading wish list? Articulate Storyline has been surrounded by a lot of hype for quite some time, and its launch has been no exception. However, behind it all is a solid product with simple yet powerful features and abilities. Recently out of beta and released to the public, Storyline is the latest software product from a vendor that’s proven it understands what eLearning professionals want and learners are engaged by (no pun intended). Storyline continues on the success of the Articulate Studio product line with a new, yet familiar feeling authoring tool. While no longer a PowerPoint plugin like Articulate Presenter, Storyline maintained an interface very similar to PowerPoint. So anyone familiar with PowerPoint 2007 or higher will immediately feel at home with the basic Storyline capabilities. Many of Storyline’s features have been long awaited. Here are three that, in my opinion as a former beta tester, separate it from its predecessor Articulate Presenter and other authoring tools. Without rehashing any of the Flash vs. HTML5 debate, the fact is the web is in a state of flux. It’s an exciting, yet often difficult, time to develop materials for web delivery, especially eLearning. Flash has its limitations, but currently so does support for HTML5. Then there’s the whole issue of native mobile apps. Choosing which technology to develop for is a tough decision. No single program is going to solve that dilemma, but at least with Storyline, we finally have a tool that gives us the option to publish as Flash, HTML5, or iPad app. It will be interesting to see just how well these newer publishing options fare over time. Articulate Presenter was always a great product, but it lacked one key feature: variables that can be acted upon by actions. Storyline solves that problem quite well with the addition of variables and programmable actions known as triggers. With triggers, you can build simple or complex interactivity. For example, you can use a single trigger to jump to the next slide, or use a series of triggers and variables to create a drag and drop activity. With only a very basic understanding of programming, the sky is the limit. Best of all, all triggers are listed in order (and in plain English) in a trigger pane. 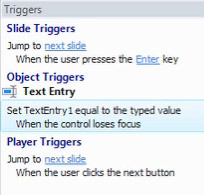 If you need to change a trigger, such as jumping to the next slide instead of the previous, you can do so right from the trigger pane. Storyline has built in sets of characters, both illustrated and photographic, that can act as avatars or characters in a story. While not the first authoring tool to add such a feature, Storyline makes manipulating character expressions and poses very simple. The real fun starts when you combine Storyline’s triggers and object state feature. You can easily change character expressions, poses, etc. based on the learner’s actions. For example, an avatar can smile when the learner selects a right answer, or show concern when a wrong answer is chosen. It’s really amazing how quickly interactions like that can be created. Those are just some of the features of Storyline. A full list of features is detailed on Articulate’s website. An instructional designer serves many functions in a training initiative, one of which is often project manager. However, we sometimes lose sight of this critical role. In a lot of cases, we are managing a team of people to create an end product, and we rely on several project team members to accomplish actions that enable us to create the instructional materials. In this post, I address some of the critical things we need to be aware of in project management and a few tools to use along the way. First and foremost, we need to identify who a project’s key stakeholders are, including subject matter experts (SMEs), and gather this team of people together to create a project plan. Let’s look at some of the critical elements of a project plan and then discuss some ways to create one. Identify WHAT you will produce. Are you simply creating a web-based course, or are you partnering it with a job aid or online reference tool? If the course is instructor-led, will you produce a participant guide, instructor guide and PowerPoint presentations? The most important thing is to be clear about what you are producing and include everything so that your client and team are all in agreement. Identify project milestones. What are the dates of SME review and deadlines for producing the material? Make sure you allow yourself enough time for thorough review by SMEs and stakeholders. Identify WHO will complete each task/milestone. Assign each task to someone on the project team and document it. It is your responsibility to regularly follow up with all team members and make sure that they report back on their progress regularly. Communicate! Set up regular meetings with your team. The frequency depends on the project and availability of your team, but I like to have weekly meetings throughout the life of the project. A common software used for project management is Microsoft Project. It includes a Gantt chart to visually represent milestones and completion of tasks. There are several other benefits to using Microsoft Project, including the ability to list out your project milestones in tasks and sub-tasks while easily assigning resources, due dates and other relevant information. It is a great way to organize all of the tasks and sub-tasks associated with a project. You can also change font colors to help you keep track of how tasks are organized. However, the Microsoft Project is expensive and is usually outside of the standard software package for many companies. You also can run into problems if you are trying to share your Project file with team members, as they will not be able to view it if they do not have Project on their own computers. I like to use Microsoft Excel for project plans. While it does not include a Gantt chart, it is easy to use and maintain, and most people have Excel available. You can use colored text and other formatting and formula tools to draw out certain milestones or information. The conditional formatting feature can be especially helpful for highlighting tasks according to their status or drawing attention to one that becomes past due. You can also create formulas to help you calculate due dates that take into account the type of task and your resources’ availability. I like to start simply by listing all of the deliverables and then listing resources and due dates for each one. There are also many online project management tools that you can use – just put “online project management software” in your Google search, and you will see many options. Some are freeware while others will have fees associated with them. Whatever tool you choose to use, it should be easily viewed by your team members and easy to maintain. We have all experienced “scope creep” in our projects, and things can change rapidly. Using a tool such as Project or Excel to build a maintainable project plan will help you stay ahead of these changes. What tools do you use for project management? Feel free to share your experiences. Microsoft PowerPoint is a very powerful tool for creating presentations. At most organizations it also has a large user base. This means that a lot of content is developed in PowerPoint. There are times when you may want to reuse content created in PowerPoint in e-learning. Adobe Captivate does a great job of integrating with PowerPoint and converting slides to an e-learning format. Captivate can bring in backgrounds, text, images, and even animations and timings. Getting started is easy. Just open Captivate and choose to create a new project from Microsoft PowerPoint. Captivate takes a moment to analyze the file and then presents you with several options. Honestly, you could probably just accept the defaults and go on your way. However, you will want to take a closer look to make sure the project behaves appropriately once it is imported. The project properties are pretty basic. Here you can set the name of the project file in Captivate and you can set a width and a height. If you decide to change the width and the height, you will want to strongly consider maintaining the aspect ratio. Maintaining the aspect ratio will make sure all the fonts and graphics are resized accurately if you increase or decrease the size of the project. In this section you can select which slides to import. In many cases you will want to select all. However, there are just as many situations where you may only want to pull one or two slides out of an existing presentation. For example, you may want to pull in one or two informative graphics from the face-to-face version of the course. Another example, you may have asked a subject matter expert to put together a graphic or animation to use in the course. As is quite common, they may be familiar with PowerPoint but not have Captivate installed. The last thing you will want to do before starting the import process is select a method for advancing slides once they are in Captivate. There are two choices here: on mouse click and automatic. On mouse click will make the slides behave similar to a PowerPoint presentation. The learner will need to click on each slide to advance it. Behind the scenes Captivate is just putting a large click box on each slide. Automatic will advance to the next slide after the default time period for each slide has passed. The default for this is 3 seconds but it could be longer if the slide contains an animation. Notice also there is a check box for Linked. Checking this will tell Captivate that you want to keep the PowerPoint project tied to this Captivate project. This is useful when you update the PowerPoint project and want Captivate to update also. To do this select update when right-clicking on the PowerPoint presentation in the project library. When you have all the settings, click Ok to import the project. Once the importing is complete you can still edit a slide in PowerPoint. Do this by right clicking on the slide and selecting Edit with Microsoft PowerPoint. This will launch the PowerPoint editor allowing you to edit the slide. When you are finished, the slide will automatically be updated in Captivate. Following these tips is the first step to becoming proficient when using PowerPoint to create Captivate content. Do you have any tips to share?